Quest Diagnostics will acquire the U.S. laboratory services business of Oxford Immunotec Global for an undisclosed price, the companies said today, in a deal that will expand the buyer’s offerings in infectious disease diagnostics to include testing services for tuberculosis and tick-borne disease. The acquisition will include the T-SPOT.TB tuberculosis and the Accutix tick-borne disease testing services, which Oxford Immunotec provides through its laboratories in Memphis, TN, and Norwood, MA. Oxford Immunotec plans to sell T-SPOT.TB test kits and related accessories to Quest Diagnostics under a long-term supply agreement that would take effect when the deal closes later this year. Quest Diagnostics and Oxford Immunotec added that they expect to enter into a strategic collaboration agreement designed to further grow T-SPOT.TB testing in the U.S., without offering details. “As a result of this transaction, physicians and patients across the United States will benefit from significantly broader access to our T-SPOT.TB test,” Oxford Immunotec CEO Peter Wrighton-Smith, Ph.D., said in a statement. According to its latest Form 10-Q quarterly results, filed July 31, Oxford Immunotec generated $24.962 million in combined product and service revenue during the second quarter, and $43.799 million in the first half of 2018, from T-SPOT.TB, the company’s first commercialized product. T-SPOT.TB accounts for the lion’s share of its total revenue, which was $29.318 million in Q2 and $50.688 million in January-June 2018. 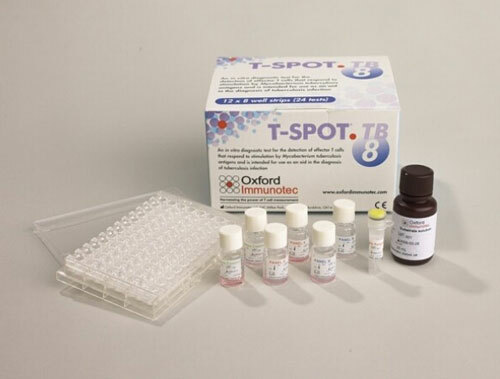 Last year Oxford Immunotec derived approximately 83% of its revenue–$85.281 million of the total $103.08 million—from sales of T-SPOT.TB, according to its Form 10-K for 2017. Accutix testing revenue is not broken out separately by Oxford Immunotec, but is part of a “tick-borne disease and other” category that generated $4.356 million in the second quarter and $6.889 million in the first half of this year. The category racked up $17.799 million in revenues last year. Quest Diagnostics said it intends to continue to offer its QuantiFERON TB (QFT) blood testing services to physicians. The test is designed to aid in the detection of Mycobacterium tuberculosis, the bacteria which causes tuberculosis (TB). QFT is an interferon-gamma (IFN-γ) release assay (IGRA), and an alternative to the tuberculin skin test (TST, PPD or Mantoux). Steve Rusckowski, Chairman, President and CEO of Quest Diagnostics, told analysts on the most recent quarterly conference call July 24 that the company enjoyed “strong growth” in QuantiFERON TB blood testing services, without giving details, according to a transcript published by Seeking Alpha. Last year, Quest Diagnostics introduced to market its Xpert MTB/RIF test, designed to provide simultaneous detection of both mycobacterium tuberculosis and rifampin resistance mutations. The test is intended to help physicians decide on whether to remove patients with suspected tuberculosis from isolation earlier. The deal has been approved by the boards of both companies, and is expected to be completed in the fourth quarter of 2018, subject to customary regulatory approvals, Quest Diagnostics and Oxford Immunotec said.